Whilst it’s true that there are fiestas and festivities in Spain throughout the year, I always feel that it’s the month of May that really kicks off the party season! At the start of the month there’s El Día de la Cruz (the Day of the Cross) and last week I posted about my visit to the Patio Festival in Córdoba where I saw the most amazing displays of flowers. 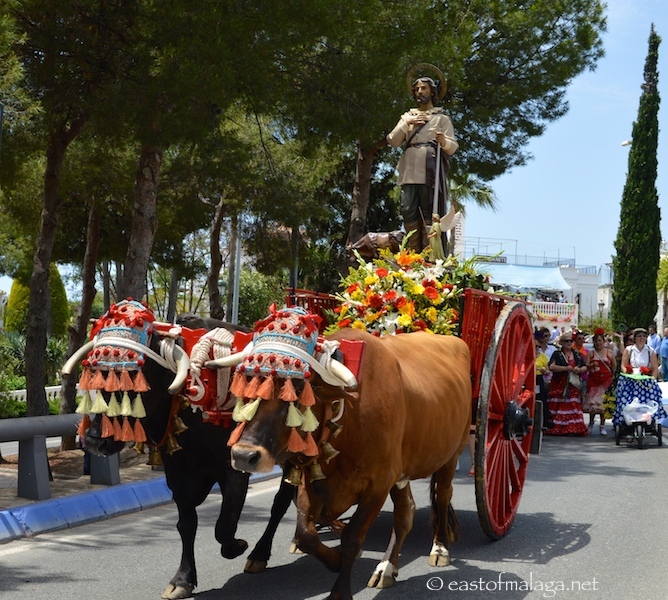 The Romería de San Isidro takes place on 15th May each year, in honour of Isidro, a farm labourer who, according to legend, received divine assistance to perform his work and was known for his goodness toward the poor and animals. As a result he has become the patron saint of farm workers and other labourers in many Spanish-speaking countries. 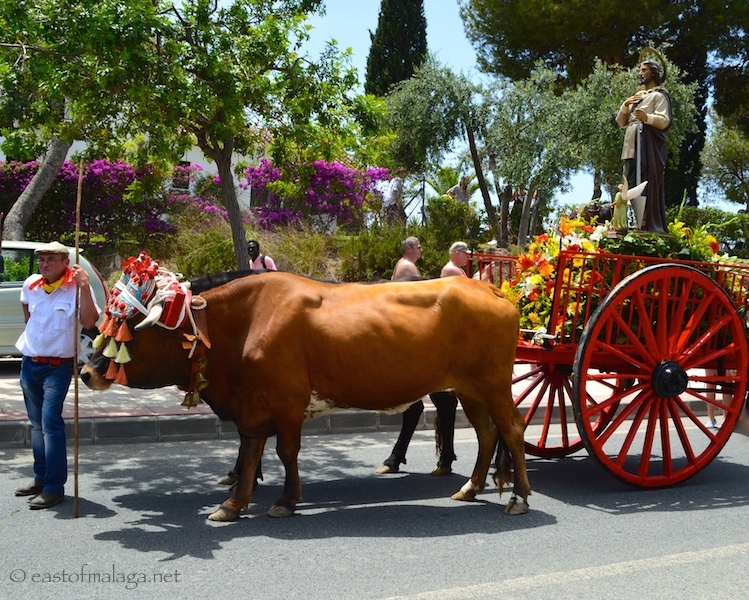 San Isidro is also the patron saint of Nerja, so this is one of the biggest fiestas of the year to be held in the town. The festivities begin with a service at the church of El Salvador on the Balcón de Europa, before the effigy of the saint, (which normally resides at the Caves of Nerja), is taken back to the Hermitage of San Isidro in Maro. The spectacular procession to accompany the Saint normally takes more than three hours and is a fantastic opportunity to see the many decorated carts, Andalucían thoroughbred horses, traditional costumes and pairs of magnificent oxen pulling beautifully adorned carts, including the one carrying the statue of San Isidro, himself. What was of particular interest to me this year, were the beautiful dresses worn by many of the ladies. 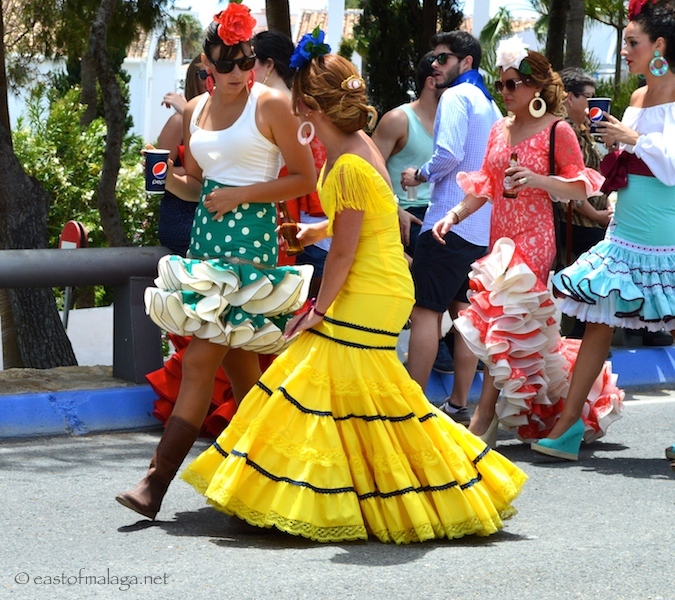 I noticed that as well as the traditional Spanish dresses, many of the younger women were wearing much shorter “flamenco-type” dresses with flat boots. I love the elegant, longer dresses – but which do you prefer? Anyway – back to the procession! On arrival at the Caves of Nerja the celebrations really begin, with families and friends sharing picnics, paella, BBQs and, of course, plenty of wine and beer. This is followed by singing and dancing amongst the thousands of revellers until late into the night. 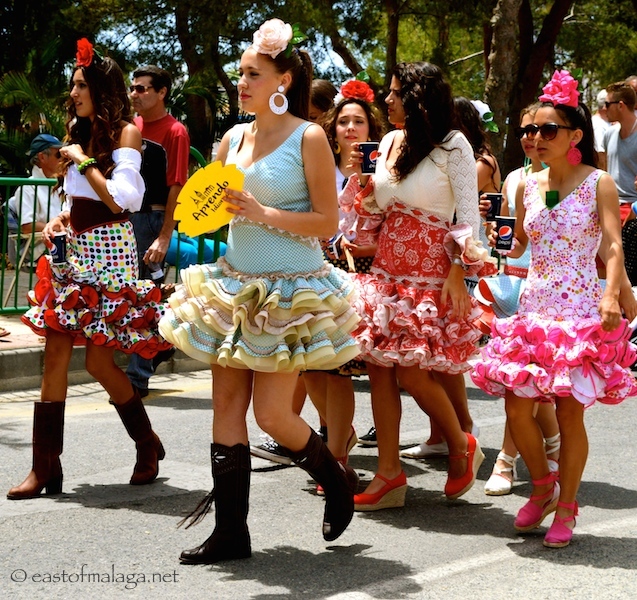 San Isidro is one of the best festivals of the year – vibrant, colourful and great fun. It usually heralds the start of good weather for the summer, as many locals say that the summer starts on 15th May! Which is your favourite Spanish festival or fiesta? This entry was tagged Andalucía, culture, customs, East of Malaga, Europe, fiestas, Food, life, Malaga, Nerja, photography, Religion, travel. Bookmark the permalink. Looks like everyone agrees that the long version is better. No, I didn’t know the origin of the “Traje de flamenca”, but your recommended article gives a great explanation. The long dresses are, to my eye, definitely more elegant. The colour, though, is simply stunning. Wonderful pics-as always. Yes, we all seem to think the same – long it is! I simply adore the more traditional longer trajes. Once again fantastic pictures. Love your new format and the femininity of the women in those gorgeous dresses! My short self could not pull it off but I love them! Beautiful photos! I love all the colors and the gorgeous long dresses! Thanks for taking us to this party with you, Marianne! It’s so nice to see the floats remain authentic and not commercialized. Too bad about those short flamenco dresses … somehow I don’t believe they will have the lasting power of the elegant long beauties! I can just imagine the singing and partying that went on into the night. Olé! I am much more of a fan of the longer dresses. The one in the slideshow…pale yellow with blue around the sleeves and frills…WOW…that is gorgeous. have to wonder what the animals make of all that dangly stuff in front of their eyes though. Must be very distracting I would think. Haven’t tried it yet Marianne, but am hoping to attend the Alfarnate Cherry Festival this year, simply because I love cherries. I am finding that as I travel north through Portugal they are becoming better quality and cheaper. Am in cherry heaven! I’m not a fan of cherries, Maggie – but it must be almost cherry season, surely? I did see some of the younger girls sitting side-saddle on the horses, Meredith (which I guess they would have to for the sake of decency!) …. but the long dresses draped over the horses look amazing! Gorgeous! But…I prefer the longer ones! Oh yes, we would, Jo! I love both long and short dresses, but the boots are not flattering. Beautiful festival. So colorful. We don’t have anything like that around here. I think we all agree about the boots, Lynne, but I guess they have to make statement. Ahh it’s the long dresses for me, especially the red one we see from the back. I like both dresses but I too prefer the longer ones. they look much more elegant. here’s another thing I just added to my just started list of things I want to do in Spain 😉 Thanks for more wonderful photos! and information on this festival too. You are going to be SO busy when you get here!!! I am Pat Sands speaking partner and I will be leading the trip to Provence with Pat. just joined your blog having heard so much about you and your life in Spain. I love the photos and I will enjoy being part of your community! Very kind of you to drop me a message. This festival seems like a lot of fun. I might have to check it out next year! 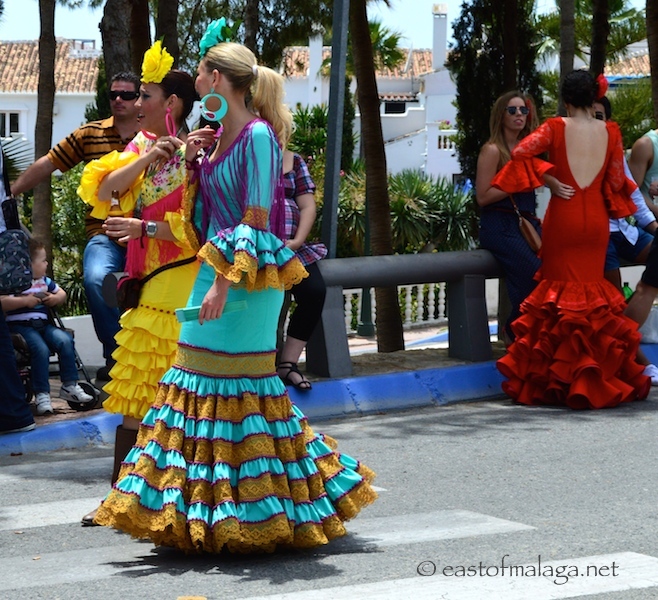 This particular fiesta is always great fun – I would definitely recommend it to you for next year. I swear that the procession was longer this year than last year though. There just seemed to be an endless stream of carts and trailers which is no bad thing and the crowds were enormous!!! Particularly at the Hotel Los Arcos on the way out of town. As for the dress discussion, I too think the longer dresses are prettier but the short ones with boots are very typical of the youth from the area. I thought it was a longer procession, too, Stevie. I watched it from near to Fuente del Baden – and by the time they reached us they were a bit spread out – with gaps between groups. I have to say, I’m not keen on the shorter ones, they don’t look right to me, especially with boots – just my opinion though lol. I live the long ones, glamourously pretty :). Missing Spain after getting back on Tuesday from a week down there, I was checking out which area I’d most like to live 🙂 Hoping either later this year or next. Yes, I can see that the shorter dresses have their advantages …. but I still prefer the longer ones. I’m all for the traditional long dress as I think the boots are ugly paired with those dresses. Anyway the surprise is always so much nicer when kept covered till the last minute. Was always a maxi or sometimes midi fan in the 60′s and never quite understood the mini….old before my time probably Marianne. I’m all for the traditional long dress as I think the boots are ugly paired with those dresses. Anyway the surprise is always so much nicer when kept covered till the last minute. Was always a maxi or sometimes midi fan in the 60’s and never quite understood the mini….old before my time probably Marianne. I wonder if they are going for the “flamenco cow-girl” look? You’re right – the boots and the shorter dresses are a fashion faux-pas, as far as I’m concerned. WooHoo! Then you saw all the gorgeous dresses! I think that’s often the case that you don’t really know what’s going on – the best thing is just to join in anyway!! Thanks for your comment, Sue – much appreciated. I’d wear the long dress, because it’s traditional, and because my legs are best covered all the way to the ground. However, if I were 20 and looking for a man, I’d wear the short one. Great photos – colourful and happy. Feel good photos. Thanks for the kind words, Trish – as always.